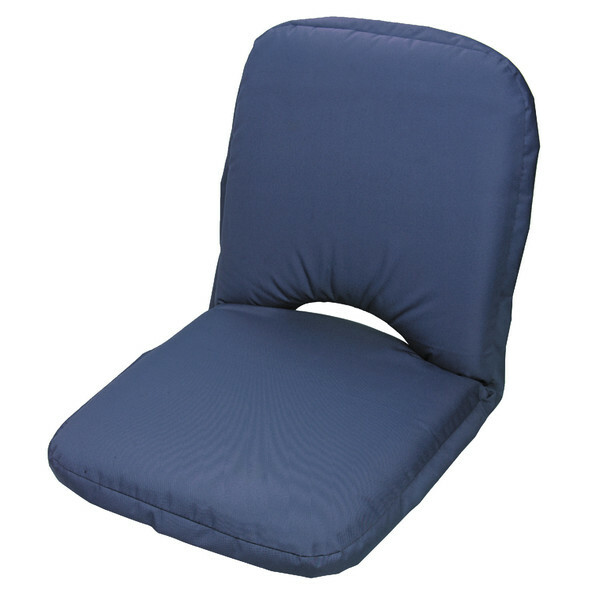 You can take this durable, all-in-one cushion, seat and recliner anywhere. Our exclusive Go-Anywhere Low Back Seat 2 features a durable, UV-resistant, 7oz. polyester fabric that is urethane coated to prevent moisture absorption so it won't get soggy and heavy when exposed to wet environments. Comfortable inner cushioning is supported by a powder-coated steel frame with a heavy-duty, five-position ratcheting hinge that allows you to adjust your seating position from upright to reclined. A handy mesh pocket in the back keeps suntan lotion and magazines at the ready. Since it lies completely flat for easy transport, our Go-Anywhere Seat 2 travels virtually anywhere you would want a comfortable seat: your sailboat; your power boat; your pontoon boat; your houseboat; the beach; the ballpark; your backyard; the park; the soccer field; the block party; the boat dock; the outdoor concert; your game room; your campsite; your deck; and we'll bet you can think of a few more.